KOLWEZI, DEMOCRATIC REPUBLIC OF CONGO – Robert Friedland, Executive Chairman of Ivanhoe Mines (TSX: IVN; OTCQX: IVPAF), and Lars-Eric Johansson, Chief Executive Officer, announced today that the company has completed an independently verified, updated Mineral Resource estimate for the extremely-high-gradeKakula Discoveryon the tier one Kamoa-Kakula Copper Project, near the mining centre of Kolwezi in the Democratic Republic of Congo (DRC). The Kamoa-Kakula Project is a joint venture between Ivanhoe Mines, Zijin Mining and the government of the Democratic Republic of Congo. 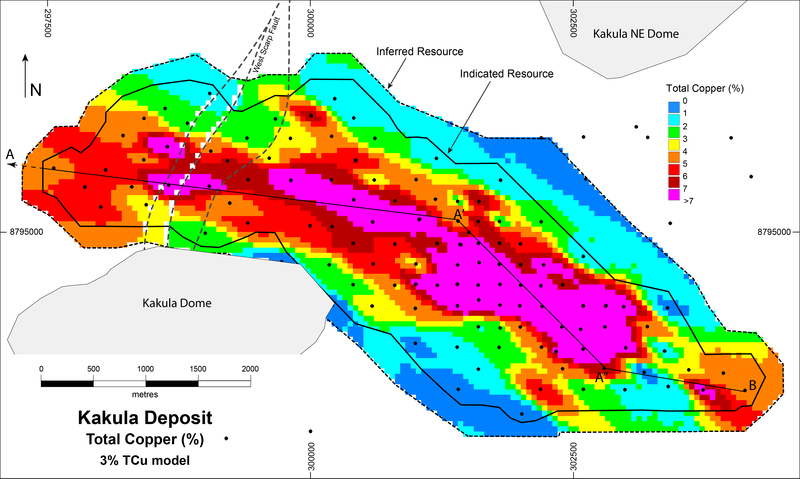 The new Mineral Resource estimate covers a strike length of approximately 7.7 kilometres along the eastern section of the Kakula Discovery. It boosts the tonnage of Kakula’s estimated Indicated Resources by 75% compared to the October 2016 resource estimate – which covered a strike length of 4.1 kilometres. Kakula’s Indicated Resources increased by 50 million tonnes, to the current total of 116 million tonnes at 6.09% copper, at a 3% cut-off grade. This compares to 66 million tonnes at 6.59% copper estimated in October 2016, also at a 3% cut-off grade. 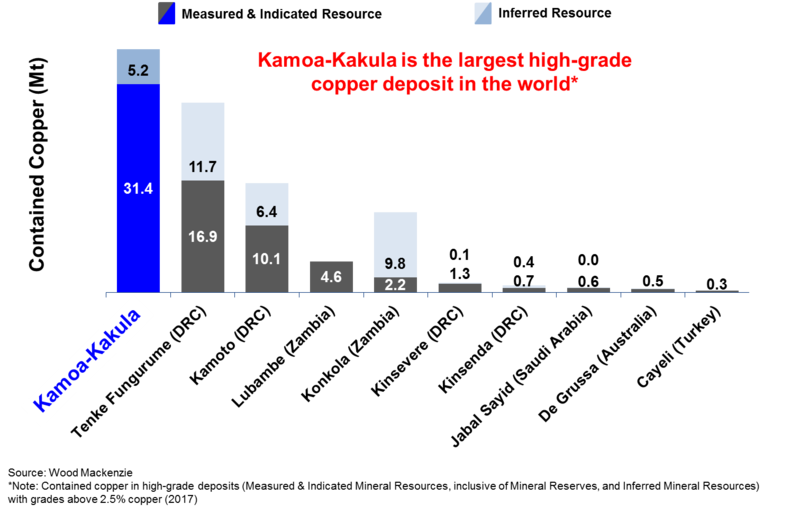 Kakula’s new estimated Inferred Resources are an additional 12 million tonnes at 4.45% copper, at a 3% cut-off. “With 12 rigs currently drilling at Kakula and Kakula West and another two rigs about to begin testing important new targets on the licence area, Kakula is an international story of discovery that has earned the mining world’s attention,” said Mr. Friedland. 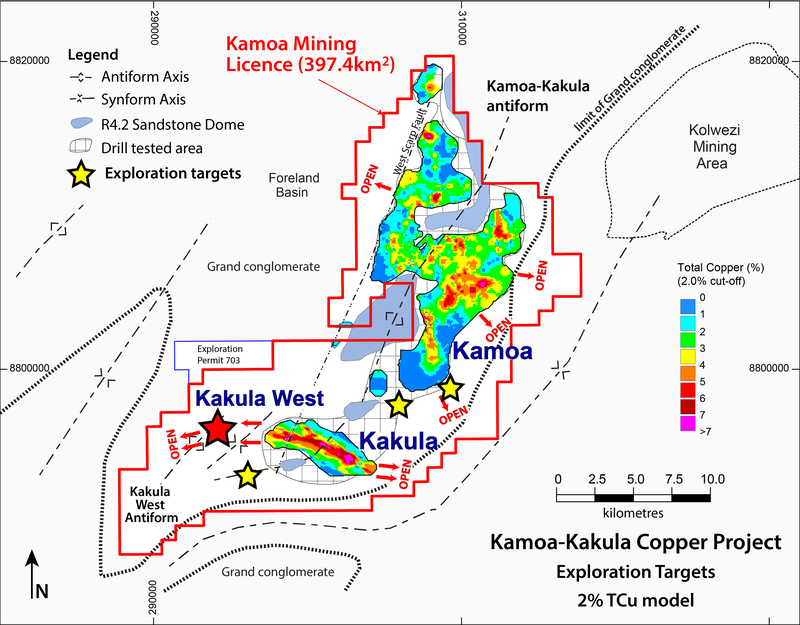 Mr. Johansson said that the copper grades at Kakula are significantly higher than the average grades found at the adjacent, earlier Kamoa Discovery. “We’re highly confident that fast-tracking mine development at Kakula will have a profound, positive impact on the economics of the overall Kamoa-Kakula Project. The Kakula Discovery is approximately 10 kilometres southwest of Kamoa’s initial Kansoko Mine development. Ivanhoe and Zijin have been conducting an aggressive drilling program at the Kakula Discovery since April 2016. More than 85,000 metres of drilling have been completed. Given the outstanding success to date in delineating high-grade copper resources, the Kakula drilling program is expected to continue throughout 2017. “The potential exists to find another Kakula. Or perhaps something even better,” Mr. Friedland said. 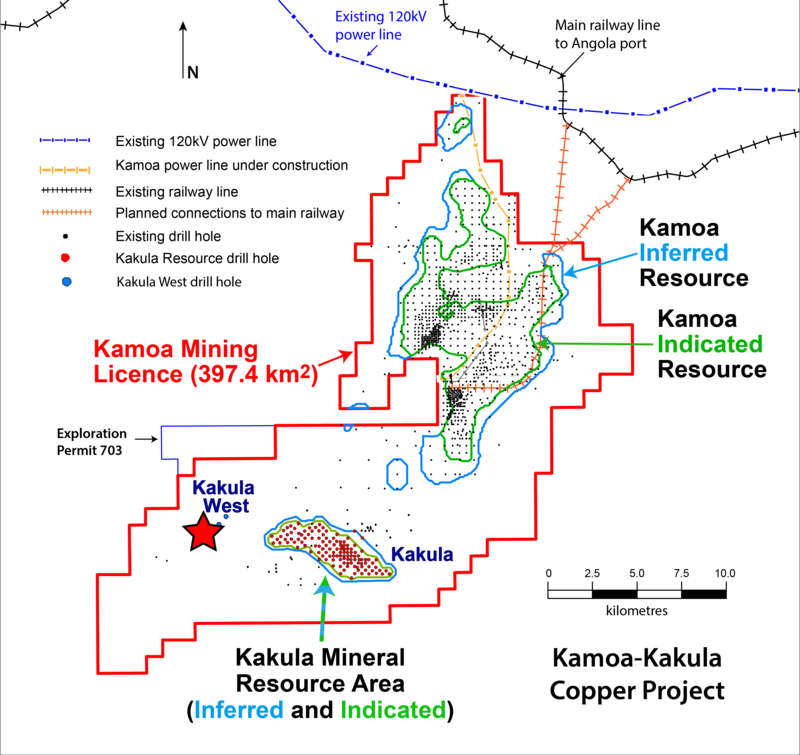 and Inferred Mineral Resource areas, and the Kakula West Discovery. Table 1. Indicated and Inferred Mineral Resources at a 1% copper cut-off grade, Kakula Deposit. Ivanhoe’s Mineral Resources Manager George Gilchrist, a Member of the Geology Society of South Africa and Professional Natural Scientist (Pr. Sci. Nat) with the South African Council for Natural Scientific Professions (SACNASP), estimated the Mineral Resources under the supervision of Dr. Harry Parker and Gordon Seibel, both RM SME, who are the Qualified Persons for the Mineral Resources. The effective date of the estimate is May 16, 2017. Mineral Resources are estimated using the CIM Definition Standards for Mineral Resources and Reserves (2014). Table 2. Kakula Deposit Indicated Mineral Resources, Sensitivity Cases. Table 3. Kakula Deposit Inferred Mineral Resources, Sensitivity Cases. The Kakula resource model was constructed using a series of nested grade shells at 1%, 2% and 3% cut-offs. A minimum thickness of approximately 3.0 metres was applied to the 3% grade shell and the outer shells were nested above and below this central shell. The resultant model allows the flexibility to show distribution of grades and thicknesses across the various grade shells and highlight Kakula’s outstanding, high-grade potential. 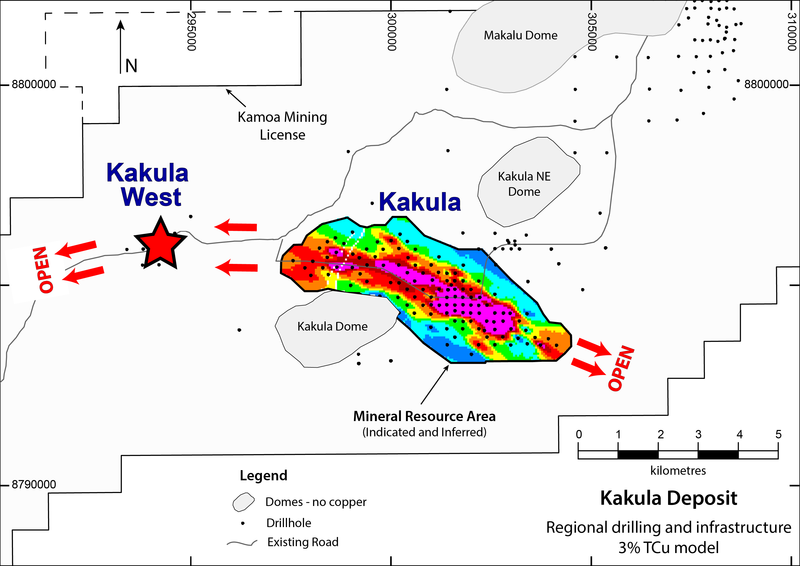 In March 2017, Ivanhoe announced that a new step-out hole – drilled 3.0 kilometres west of the boundary of Kakula’s May 2017 Inferred Resources – intersected a relatively shallow, 16.3-metre (true width) zone of typical Kakula-style, chalcocite-rich copper mineralization similar to holes drilled in the centre of the eastern portion of the Kakula Deposit. Assays for the discovery hole – DD1124 – confirmed the high-grade discovery with assays of 5.83% copper over 8.86 metres (true width) at a 2.5% cut-off, including a 6.14-metre (true width) interval at 6.84% copper. 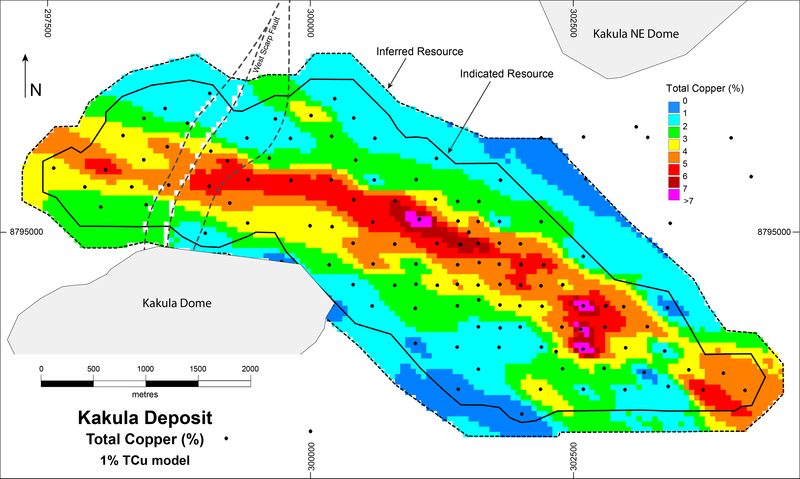 Resource blocks at a 3% SMZ cut-off, and the Kakula West Discovery. in Kakula’s 3% selective mineralized zone. Kakula is the second major discovery on the Kamoa mining licence in the past nine years. The Kamoa Deposit, which was announced as a major new discovery in 2009, is now under initial development with twin declines nearing completion at the Kansoko Mine. An independent prefeasibility study was completed on the Kamoa Deposit in February 2016 and is the basis of Kamoa’s current mineral reserve for the Kansoko Mine. Table 4. Consolidated Mineral Resource Statement, Kamoa-Kakula Project – May 16, 2017, 1% copper cut-off over minimum thicknessof approximately 3 metres. Table 5. Indicated and Inferred Mineral Resources, Kamoa-Kakula Project– May 16, 2017. 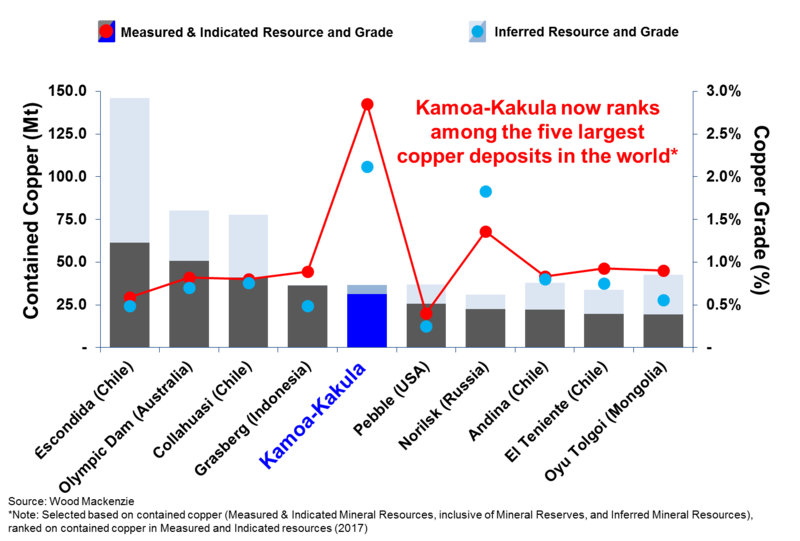 The May 2017 Kakula estimate firmly establishes the Kamoa-Kakula Project in the ranks of the five largest copper deposits in the world – and its copper grades are the highest, by a wide margin, of the copper world’s top 10 deposits (see Figure 7). Significantly, both the Kakula Discovery and the earlier Kamoa Discovery continue to remain open for expansion. 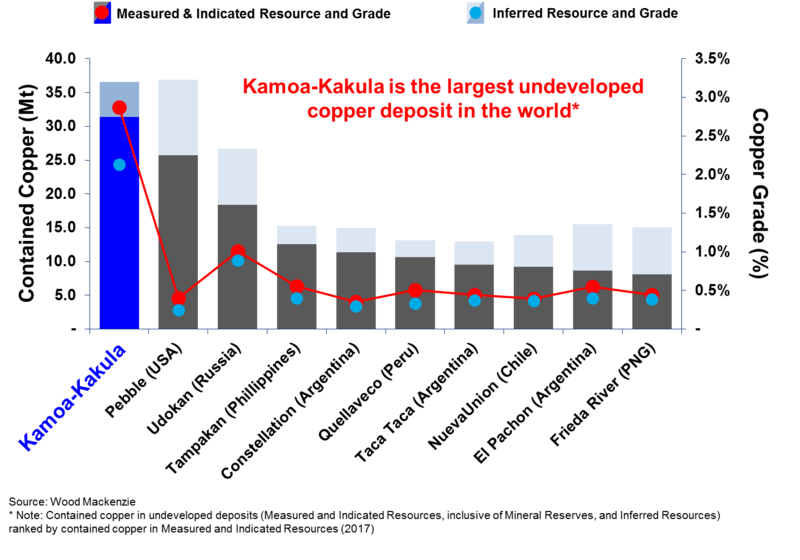 Research by Wood Mackenzie also shows that the Kamoa-Kakula Project’s distinctions include the world’s largest, high-grade (>2.5% copper grade) copper deposit and the world’s largest, undeveloped copper deposit, based on contained copper in the project’s Measured and Indicated Mineral Resources. World’s largest undeveloped copper deposits. Ivanhoe Mines is advancing its three principal projects in Sub-Saharan Africa: 1) Mine development at the Platreef platinum-palladium-gold-nickel-copper discovery on the Northern Limb of South Africa’s Bushveld Complex; 2) mine development and exploration at the Kamoa-Kakula Copper Project on the Central African Copperbelt in the DRC; and 3) upgrading at the historic, high-grade Kipushi zinc-copper-lead-germanium mine, also on the DRC’s Copperbelt. For details, visit www.ivanhoemines.com. 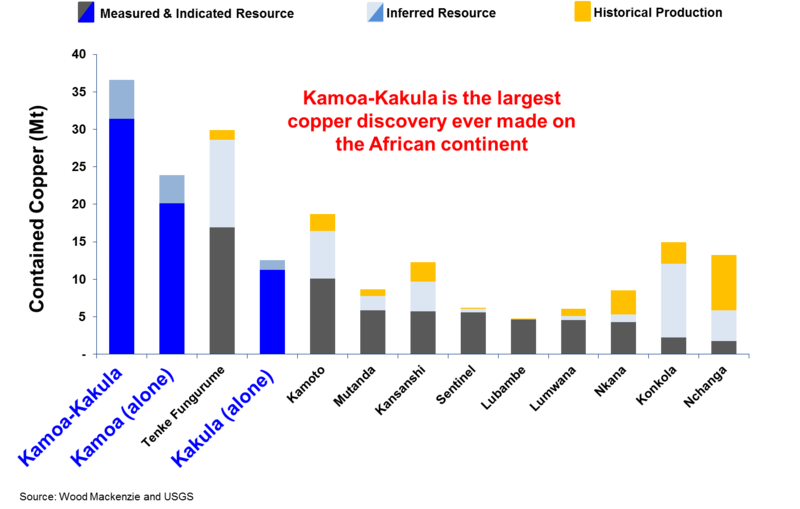 Certain statements in this release constitute “forward-looking statements” or “forward-looking information” within the meaning of applicable securities laws, including without limitation, the timing and results of (1) statements regarding the Kakula Discovery remains open for significant expansion in multiple directions; (2) statements regarding twelve drill rigs rapidly expanding bonanza-grade copper resources along the Kakula trend, including the new Kakula West Discovery; (3) statements regarding the expectation that the expanded case preliminary economic assessment is to be issued in the third quarter 2017; (4) statements regarding that Ivanhoe is highly confident that fast-tracking mine development at Kakula and Kakula West will have a profound positive impact on the economics of the overall Kamoa-Kakula Project; (5) statements regarding Ivanhoe is confident that Kakula West has similar potential as the Kakula Deposit; (6) statements regarding the Kakula drilling program is expected to continue throughout 2017; (7) statements regarding that there at least nine high-priority targets located in the untested areas of the Kamoa-Kakula Project that are planned to be drill tested this year; (8) statements regarding the bottom-loaded mineralization at Kakula will support the construction of selective mineralized zone (SMZ) composites at cut-offs up to at least 3% copper; (9) statements regarding the potential exists to find another Kakula; (10) statements regarding the Kakula Discovery remains open for significant expansion along trend to the west and the southeast; (11) statements regarding the high-grade Kakula Discovery presents transformational opportunities for Kamoa-Kakula development; (12) statements regarding that mineralization at Kakula is consistently bottom-loaded and will support the construction of selective mineralized zone (SMZ) composites at cut-offs up to at least 3% copper; (13) statements regarding the lateral consistency of mineralization at these higher cut-offs presents significant opportunities for mine planning; (14) statements regarding two drill rigs will begin drilling infill holes between Kakula West and the Kakula resource area; (15) statements regarding the timing of a revised preliminary economic assessment (PEA) for two six-million-tonne-per-year mines ─ one at Kamoa’s Kansoko Sud and one at Kakula; (16) statements regarding expectations that the increased resource base at Kakula will support a mine capacity of approximately six Mtpa; (17) statements regarding the Kansoko mine capacity also is expected to be six Mtpa, giving the revised PEA a projected peak mine production of approximately 12 Mtpa from the presently delineated Kamoa and Kakula deposits; (18) statements regarding, the Kamoa-Kakula development plans will be reassessed and amended as the project advances; (19) statements regarding that the updated PEA will analyze process facilities, mining planning and scheduling, including capital costs and operating costs for both mining and concentrator operations and will draw on recommendations from the Kamoa 2016 pre-feasibility study and the Kamoa-Kakula PEA issued in December 2016; and (20) statements regarding the clear zonation and grades in the central high-grade core should provide sequencing opportunities to mine at significantly elevated grades; (21) statements regarding the Kamoa technical team is proceeding with the construction of a box cut at Kakula to accommodate decline ramps that will provide underground access to the deposit; and (22) statements regarding the continuation of the Kakula drilling program throughout 2017.